Audi's rivals in Stuttgart and Munich have recently figured out that the yawning gap between their ultra-high-performance models and their regular lineups is perfectly suited for a range of in-between versions. And so Mercedes launched its AMG 43 models, while BMW created a range of M Performance vehicles. For its part, Audi has been making such models for 25 years in the form of its S cars?more sporting than the standard A range but less extreme than the full-on RS screamers engineered by the Quattro GmbH high-performance division in Neckarsulm. The most prominent of these is probably the S4, which slots in neatly between the A4 and the RS4. (The RS hasn't been offered in the U.S. since the last generation and currently is being redesigned). To begin with, the S4 employs an all-new, 3.0-liter turbocharged V-6; internally called EA839, this engine is related to the 4.0-liter V-8 that Porsche will use in the next Panamera. Fitted with a BorgWarner twin-scroll turbocharger, the new mill makes 354 horsepower at 6400 rpm and produces 369 lb-ft of torque starting at a low 1370 rpm. That's 21 more horsepower and 44 more lb-ft of torque than was offered by the S4's previous 3.0-liter supercharged V-6. This engine mates to an eight-speed ZF torque-converter automatic, a unit that replaces the previous model's seven-speed dual-clutch automatic (DSG). The S4's six-speed manual, previously standard equipment, also is dead. Really? Audi says it went for the conventional automatic because U.S. customers prefer the smooth torque-multiplication effect when taking off at a stoplight, something the dual-clutch gearbox is unable to provide. But didn't Audi just tell us the new engine makes more torque at lower rpm? 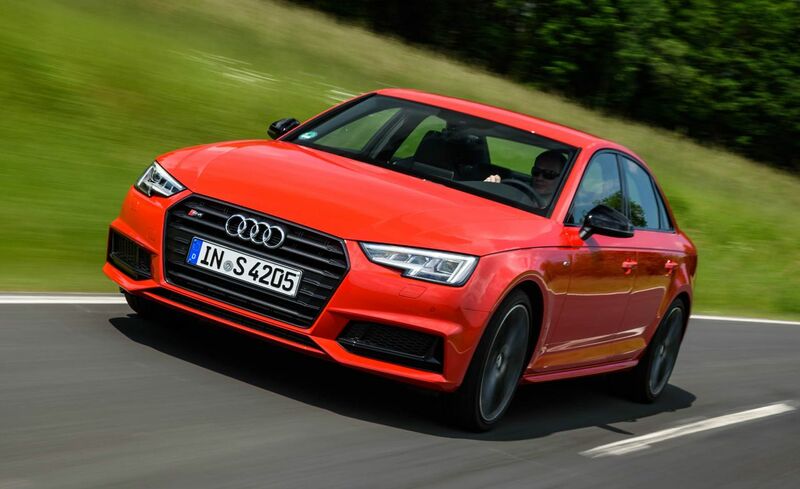 We're not following Audi's reasoning, given that the A4 still offers the DSG and the S4 is a performance model targeting drivers seeking greater involvement. Audi also says that the manual, which accounted for about 10 percent of sales, was scuttled because many advanced driver-assistance functions don't work as well with it. The car needs control of the transmission if it's to fully automate the speed, steering, and braking, they say. And it's those functions, Audi asserts, that will be the essential elements of the performance sedan of the future. We pity anyone who'd choose a car like the S4 with the expectation of having it drive itself even semi-autonomously?that misses the whole point. Count the rise of autonomous driving as another blow in the continuing beatdown of manual transmissions. That said, if we're forced into a traditional automatic, this ZF 'box is one of the best. It provides quick shifts and seems less prone to hunting for the right gear than the previous model's dual-clutch unit. What we'll never know is how well the dual-clutch might have worked with this engine's fatter torque curve. The S4 is fitted with steering-wheel-mounted paddles for manual gear selection, but we wish those paddles were metal instead of plastic. Audi cites a zero-to-62-mph time of 4.7 seconds?we suspect that's conservative, and we think that the new S4 should get to 60 mph about a half-second quicker. Top speed is governed at 155 mph. The S4 is powerful enough to charge into triple-digit speeds with ease, but we wish it evoked a bit more emotion. Throttle response is not as immediate as it was on the outgoing supercharged car, and the engine's soundtrack comes across as artificial. There are some slightly unpleasant midrange vibrations felt through the floorboard and the steering column, and the engine is clearly audible at idle?but not in a way that suggests a high-performance powertrain. Moving the drive-mode selector from Dynamic to Auto or Comfort will quiet the S4?so effectively, in fact, that you would never imagine its performance potential. Yet it's strong, both in a straight line and in corners. The permanent all-wheel-drive system is tuned to shove most of the torque to the rear wheels, and, especially when equipped with the optional rear sports differential and the dynamic-steering system, the S4 becomes a truly agile performer that will take on a souped-up hot hatchback or pony car any time. How it may fare against the more natural analogs of a BMW 3-series in M Performance tune or a Mercedes-AMG C43 sedan must await our first opportunity to do full track testing. What we can add for now is that it is comfortable enough to soak up hundreds of miles without unduly stressing the driver and passengers. In Europe, the S4 comes with all the available assistance systems that are on the A4, albeit with a few tweaks, including the S4-specific screen with a central tachometer for the TFT gauge cluster. Outside, the S4 is differentiated from the A4 by its aluminum-accented rearview mirrors, unique grille with double bars, and quad exhaust pipes. It's distinct enough from the A4, but the A4 itself is a disappointingly timid redesign; more than a few customers may have trouble distinguishing it from its predecessor. When the new S4 eventually reaches the U.S. in early 2017, pricing should remain close to that of the outgoing model, which starts at $50,125 with the now-discontinued manual transmission. While Mercedes sharpens its entry-level AMG 43 models, Audi says that its S cars will remain unchanged in their focus on balancing athleticism with daily drivability. It is no coincidence they are developed by Audi in Ingolstadt, rather than at Neckarsulm where the RS braintrust resides. Audi is staying on course, and the new S4 continues the tradition of being one of the most pleasant and understated performance sedans available. We'll be able to definitively tell if it's perhaps a bit too understated when we get to test a production model.